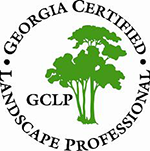 The Georgia Certified Landscape Professional (GCLP) program is a voluntary testing program that certifies those in the landscape profession who have mastered a thorough knowledge and understanding of job skills required to be successful in the industry. The GCLP program is endorsed by the Georgia Green Industry Association, the Georgia Urban Ag Council, and officially recognized by the Georgia Department of Agriculture. The Georgia Urban Ag Council is Georgia’s premier green industry association for professionals involved in all sectors of the industry. They are dedicated to advancing goals and sound policies that enhance and support an ethic of quality urban agriculture and sustainable landscaping in Georgia. The National Association of Landscape Professionals is the national trade association representing nearly 1 million landscape industry professionals in the United States, with additional members in Canada and overseas. Member companies specialize in lawn care, landscape design and installation, landscape maintenance, tree care, irrigation and water management, and interior plantscaping. Owner Hobie Barrett has a degree in Turf Grass Management from Abraham Baldwin Agricultural College, one of the premier colleges in the state of Georgia.